From October 5th to 10th Milan will host the world’s biggest industrial show, EMO 2015, which expects 150,000 visitors from nearly a hundred countries. This biennial event held in either Milan or Hanover is promoted by the European Machine Tool Industry Association (CECIMO). It currently counts 115,000 square metres of exhibition space, reserved for 1,400 companies and spread among twelve fully booked pavilions which will showcase machine tools, robots, automation solutions, additive manufacturing, mechatronic solutions and auxiliary technologies. The fair will devote a special exhibition section to additive manufacturing; besides machines it will also present products meant for the mechanics market. Conferences, workshops and seminars will also be held to highlight competitive advantages stemming from the adoption of additive technologies by some industries and processes. Specifically, the International Conference on Additive Manufacturing will take place on October 6th, jointly organised by CECIMO and the Italian Additive Technologies Association (AITA), in which the AFM-supported Additive and 3D Manufacturing Technologies Association of Spain (ADDIMAT) will also participate. The country with the most registered exhibitors is Italy, followed by Germany, Taiwan, China and Switzerland. Spain ranks seventh on the list, with 54 companies exhibiting in an area of 4,717 square metres. 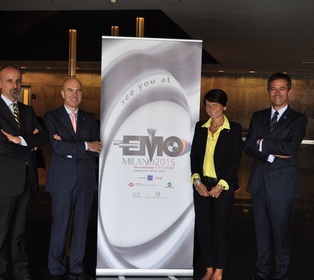 Since the first EMO was held in 1975, the AFM has organised group attendance by Spanish manufacturers, who make a major investment to showcase their most advanced solutions at what is considered the world’s top technological fair. The fact that EXPO 2015 is being held at the same time as EMO will help boost the number of visitors to Milan, which has improved its communications for the occasion. Positive forecasts regarding global machine tool consumption augur well for EMO’s success: Oxford Economics has estimated that global consumption should reach 60 billion euros in 2015, 63 billion euros (+5.2 percent) in 2016 and 66 billion euros (+4.8 percent) in 2017.